In its Weekly Report On Israeli Human Rights Violations in the Occupied Palestinian Territories for the week of 26 Nov. – 02 Dec. 2015, the Palestinian Center for Human Rights (PCHR) found that Israeli forces continued systematic crimes in the occupied Palestinian territories. 9 Palestinian civilians, including 2 children and a young woman, were killed in the West Bank. One of them was killed by Israeli settlers. On the same day, Israeli forces killed Samer al-Seiryasi (51) while stepping out of a taxi at Za'tarah checkpoint, south of Nablus. Israeli forces as usual claimed that the killed person attempted to stab settlers waiting at a bus stop, south of the checkpoint. On 27 November 2015, an Israeli settler opened fire at Fadi Mohammed Mahmoud al-Khasib (25) from Beirbala village, northwest of occupied Jerusalem, while he was passing by the intersection of "Kfar Adomim" settlement in al-Khan al-Ahmar area, east of Jerusalem. He was wounded with several bullets and immediately died. In the afternoon, Israeli forces stationed at the entrance to Beit Ommer village, north of Hebron, opened fire at a civilian car with an Israeli registration plate. As a result, the driver Omer Arafat Essa al-Za'aqiq (19) was killed under the pretext of running over 5 Israeli soldiers at the said entrance. The corpse was transported later by an Israeli ambulance to an unknown destination. On 29 November 2015, Israeli border guard agents opened fire at Basim 'Abdel Rahman Mustafa Salah (38) from Nablus after he stabbed an Israeli soldier in al-Wad Street in East Jerusalem's Old City. As a result, he was hit with more than 11 live bullets fired at him from a close range, so he immediately died in the scene. On the same day afternoon, Israeli forces killed Ayman Samih al-'Abbasi (17) from Selwan village when he was participating in a demonstration organized in Ras al-'Amoud neighbourhood, east of the East Jerusalem's Old City protesting against the death of Basim Salah, who was killed in the above mentioned crime. On 01 December, Israeli forces shot dead Ma'moun al-Khatib (16) from al-Dohah village, west of Bethlehem. Israeli forces claimed that al-Khatib attempted to carry out a stab attack near "Gosh 'Etzion" settlement complex, south of the city. On the same day, in excessive use of forces, israeli forces stationed at 'Inab checkpoint, east of Tulkarm shot dead Maram Hasounah (20) from Nablus who arrived at the checkpoint holding an axe while there were no Israeli soldiers in the area. The girl started hitting the watchtower established in the area with the axe. Therefore, the Israeli soldiers opened fire at her and she immediately died. Dream Radio in Hebron was closed for 6 months under the pretext of broadcasting "incitement", and its contents were confiscated. Israeli forces raided Dream Radio office after blowing the main door. They cut off the electricity and internet cables. In addition, they confiscated broadcast devices, including mixers, PCs, laptops, microphones and cameras. Israeli forces continued efforts to create Jewish majority in occupied East Jerusalem. A house belonging to the family of al-'Akari family in Shu'fat refugee camp, was bombed on grounds of collective punishment. As part of the collective punishment policy practiced by Israeli forces against Palestinian civilians, Israeli forces exploded the house of Ibrahim al-'Akari in Sho'afat reufgee camp, north of East Jerusalem causing severe damages to his brothers' houses. Ibrahim's house is located in the third floor in a 3-storey building, where his widow and 5 children live. Al-'Akari was killed by Israeli forces on 05 November 2015 after carrying a run over attack killing an Israeli officer and settler in al-Sheikh Jarrah neighborhood. On 27 November 2015, On Friday morning, 27 November 2015, Israeli municipality crews protected by Israeli border guard agents and Special Forces moved into the neighborhoods of al-Bustan and Beer Ayoub in Selwan village, south of occupied Jerusalem's Old city, and distributed administrative demolition orders to residential and commercial facilities under the pretext of construction without a license. On 01 December 2015, Israeli forces demolished two apartments in al-Ashqariyah neighborhood in Beit Hanina, north of Jerusalem, under the pretext of building with a license. The two apartments belong to Fawaz Mohammed Hasan al-Rajabi whose apartment is 60 square meters and shelters his nine family members, including 7 children and Nasri 'amer Mohammed Hasan al-Rajabi who apartment is 60 square meters and shelters his 7 family members, including 5 children. As part of targeting hospitals and medical centres, on 01 December 2015, Israeli forces raided al-Maqased Hospital in al-Tour neighbourhood, east of East Jerusalem's Old City, and fired tear gas canisters at it under the pretext of searching for "Molotov Cocktail throwers". On the aforementioned Thursday, Israeli forces moved into al-Hawawer area in the northern area in Hebron and levelled an 80-cubic-meter rainwater collection pool used for agricultural purposes belonging to Jihad 'Abdullah Karajah under the pretext of building in Area "C". On 27 November 2015, Israeli forces confiscated an excavator belonging to Ashraf Sawalmah from 'Asirah village, north of Nablus,. The excavator was in a land belonging to Mahmoud Hendiyah from Beit Dojn village, east of the city, cultivating the land. At approximately 07:00 on Monday, 30 November 2015, Israeli forces accompanied by a jeep belonging to the construction and organization department in the Israeli Civil Administration and crane in Kherbet al-Deir, east of 'Ein al-Beidaa' village in the Northern Jordan Valley, north of Tubas. They confiscated 4 water pumps used by farmers to irrigate their plants. The pumps belonging to 'Ammar Jihad Daraghmah; 'Ali Mohammed Bayer Motawe'a; Hussein Saleh Daraghmah and Yasser Mahmoud Asmar Daraghamah. At approximately 10:00 on Thursday, 26 November 2015, a number of Palestinian young men gathered in front of an Israeli military camp established on the western lands of the Palestine Technical University "Khadouri", west of Tulkarm, in protest against the Israeli policies in the oPt. When the protesters arrived at the area, Israeli forces moved into the western lands of the university and then heavily fired tear gas canisters at the protesters. After which, the protesters threw stones and Molotov cocktails at the Israeli vehicles. Due to which, Israeli soldiers chased the stone-throwers into the area and fired live ammunition, rubber-coated metal bullets and tear gas canisters at them. As a result, 6 protesters, including a child, were wounded with live bullets to the lower limbs of their bodies. They then were taken to Thabet Thabet hospital in Tulkarm to receive medical treatment. At approximately 12:00 on Thursday, a number of Palestinian young men gathered in al-Naqar neighborhood near the annexation wall, west of Qalqilya, and threw stones at the Israeli soldiers stationed in the area. Due to which, Israeli soldiers fired live ammunition, rubber-coated metal bullets, sound bombs, and tear gas canisters at the protesters. As a result, a child was hit with a tear gas canister to the left elbow. At approximately 12:00 on Friday, 27 November 2015, a number of Palestinian young men gathered in al-Naqar neighborhood near the annexation wall, west of Qalqilya, and threw stones at the Israeli soldiers stationed in the area. Due to which, Israeli soldiers fired live ammunition, rubber-coated metal bullets, sound bombs, and tear gas canisters at the protesters. 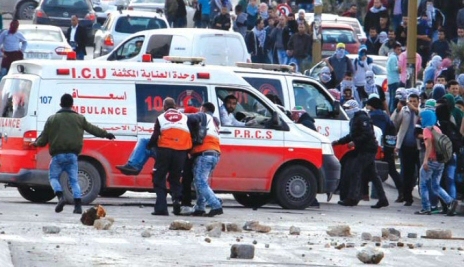 "At approximately 15:20 on Friday, 27 November 2015, the PRCS ambulance crew consisting of the ambulance driver, Azmi al-Aqra', and paramedic, Mohamed Fayoumi, were usually parking the ambulance in a safe place near al-Naqar neighborhood, west of Qalqilya. Suddenly, the Israeli forces moved into Qalqilya from another entrance and then immediately fired a sponge-tipped bullet towards the ambulance, which caused the smash of its windows. After which, when the two paramedics attempted to escape from the area by their vehicle, the Israeli soldiers heavily fired tear gas canisters at them. As a result, the paramedics suffered tear gas inhalation." On Friday afternoon, dozens of Palestinian young men gathered near al-Huda Petrol Station in al-Balou' neighborhood at the northern entrance of al-Bireh and then headed to the (DCO) checkpoint and "Beit Eill" settlement. The protesters set fire to rubber tires and threw stones and Molotov cocktails at Israeli soldiers. Due to which, the soldiers fired live ammunition, rubber-coated metal bullets, sound bombs and tear gas canisters at the protesters and between the houses. As a result, 3 civilians were wounded, two of whom were hit with rubber-coated metal bullets while the third one was hit with a live bullet to the right leg. On Friday afternoon, dozens of young men gathered in the vicinity of Ofer prison, west of Ramallah to organize a demonstration against the Israeli policies and settlers attacks. After which, the protesters made their way to the prison gate, so the Israeli forces closed the gate and deployed in the area. The protesters set fire to rubber tires and threw stones and empty bottles at the Israeli soldiers, who immediately fired live ammunition, rubber-coated metal bullets, sound bombs, and tear gas canisters at the protesters. As a result, 10 civilians, including 2 children, were wounded. Seven of whom were hit with live bullets while the three others were hit with rubber-coated metal bullets. At approximately 13:30 on afternoon, dozens of Palestinian young men gathered in al-Kamb area, south of Halhoul village, and set fire to rubber tires. After which, the Israeli forces moved into the area and deployed between the houses. The protesters threw stones and empty bottles at the soldiers, who chased the protesters and fired sound bombs and tear gas canisters at them in response. In the meantime, a number of protesters gathered in Ras al-Jourah area, north of Hebron, and then headed to a military watchtower established at the southern entrance of Halhoul village. During which, the protesters threw stones at the soldiers, who heavily fired tear gas canisters at the protesters in response. Additionally, the military vehicles stationed in al-Kamb area withdrew towards the military watchtower and then the protesters chased them there. Due to which, the Israeli soldiers fired live ammunition at the protesters. As a result, 12 civilians, including a child, were wounded with live bullets. At approximately 14:00, dozens of young men gathered at the entrance of al-Fawar refugee camp, north of Hebron, where the Israeli soldiers closed the entrance with an iron gate and established a permanently military checkpoint. The protesters threw stones and empty bottles at the soldiers stationed at the entrance. Due to which, the soldiers stationed behind cement cubes heavily fired live ammunition and tear gas canisters at the protesters. As a result, 2 civilians were hit with live bullets and then were taken by a PRCS ambulance to the city hospitals to receive medical treatment. At approximately 15:00, dozens of young men from Beit 'Awa village, southwest of Dura, southwest of Hebron, gathered near the security fence established on the village lands in the western area. After which, two Israeli patrols arrived at the area and stationed behind the security gate along the security fence. The protesters threw stones at the soldiers, who heavily fired tear gas canisters from a launcher fixed on a military jeep against them. The protesters then spread in the agricultural lands while the soldiers chased them into the agricultural fields and fired live bullets at them. As a result, 3 protesters were hit with live bullets throughout their bodies and then were taken by a PRCS ambulance to the city hospitals to receive medical treatment. At approximately 16:30 on Friday, a number of youngsters organized a demonstration in the center of Beit Foreek village, east of Nablus, and then made their way to al- Kenitra Mountain, southeast of the village. When the youngsters arrived at the area, Israeli soldiers stationed in the military watchtower in the vicinity of "Itamar" settlement fired sound bombs and live bullets at the youngsters. As a result, 2 children were hit with live bullets and were then taken to the village clinic. After the wounded children received first aid, they were taken by an ambulance to Rafidia hospital in Nablus. When the ambulance arrived at Beit Foreek checkpoint at the main entrance of the village, Israeli soldiers obstructed it for 20 minutes. At approximately 12:30 on Saturday, 28 November 2015, a demonstration started from the vicinity of 'Alaa' al-Hashash house from 'Askar refugee camp, northeast of Nablus, who was killed by the Israeli forces at Hawara checkpoint, south of the city, on 23 November 2015. The protestors then headed to the abovementioned checkpoint demanding to release the corpses that were kept in Israeli custody. When the protesters arrived at the checkpoint, Israeli forces fired tear gas canisters and live bullets in response. As a result, 2 children were hit with live bullets and were then taken to Rafidia hospital to receive medical treatment. Medical sources described their wounds as moderate. At approximately 13:00 on Saturday, dozens of young men from al-Naqar neighborhood gathered near the annexation wall, west of Qalqilya, and threw stones at the soldiers stationed in the area. Due to which, the Israeli soldiers fired live ammunition, rubber-coated metal bullets, tear gas canisters and sound bombs at the protesters. As a result, a child was hit with a rubber-coated metal bullet below the left eye. At approximately 10:00 on Sunday, 29 November 2015, a number of Palestinian young men gathered in front of an Israeli military camp established on the western lands of the Palestine Technical University “Khadouri”, west of Tulkarm, in protest against the Israeli policies in the oPt. When the protesters arrived at the area, Israeli forces moved into the western lands of the university and then heavily fired tear gas canisters at the protesters. After which, the protesters threw stones and Molotov cocktails at the soldiers in response. Due to which, the Israeli soldiers chased the stone-throwers into the center of the university campus and fired live ammunition, rubber coated-metal bullets, and tear gas canisters. As a result, 4 protesters, including a child, were wounded with live bullets. The health condition of one of the wounded children was described as serious, as a live bullet penetrated his left arm causing fractures and then penetrated his abdomen causing laceration in his stomach and liver. The abovementioned wounded child was taken to Rafidia hospital in Nablus and underwent a surgery. On Sunday afternoon, dozens of youngsters gathered near al-Huda Petrol Station in al-Balou' neighborhood, at the northern entrance of al-Bireh city. They then headed to the (DCO) military checkpoint and "Beit Eill" settlement. The protesters set fire to rubber tires and threw stones and Molotov cocktails at Israeli soldiers who fired live ammunition, rubber-coated metal bullets, sound bombs and tear gas canisters at the protesters and between the houses. As a result, 3 civilians were wounded, 2 of whom were hit with rubber-coated metal bullets while the third was hit with a live bullet to the right thigh causing rupture in the blood-vessels. Among the wounded persons was Hassan Ibrahim Najar (72), who was hit with a rubber-coated metal bullet to the head. At approximately 13:00 on Tuesday, 01 December 2015, dozens of youngsters gathered in al-Naqar neighborhood near the annexation wall, west of Qalqilya, and threw stones at the soldiers stationed in the area. Due to which, the soldiers immediately fired live ammunition, rubber-coated metal bullets, sound bombs and tear gas canisters at the protesters. As a result, 4 civilians, including 2 children, were wounded with rubber-coated metal bullets. Moreover, a tear gas canister landed in a house belonging to Ziad Dawoud Melhim, due to which the house caught fire. After which, the Civil Defense Crews put the fire out. Furthermore, the Israeli forces moved into the aforementioned area from another entrance and fired tear gas canisters towards al-'Awda School for girls. As a result, Alaa' Sa'eid Qashmar (12) suffered tear gas inhalation and was then taken to Dr. Darwish Nazal Hospital. At approximately 13:30 on Friday, 27 November 2015, dozens of youngsters headed to the border fence between the Gaza Strip and Israel, east of al-Faraheen area in 'Abasan village, east of Khan Younis, south of the Gaza Strip. A number of protesters approached the border fence, set fire to rubber tires and threw stones at the soldiers stationed along the fence. Additionally, some of the youngsters placed the Palestinian flag on the border fence. Due to which, Israeli soldiers sporadically fired live ammunition and tear gas canisters at the protesters. As a result, 2 civilians, were wounded with live bullets and were then taken to the Gaza European Hospital to receive medical treatment. The health condition of the two civilians was described as moderate. In the meanwhile, Israeli forces stationed in Beit Hanoun (Erez) Crossing, northwest of Beit Hanoun, north of the Gaza Strip, fired live ammunition, rubber-coated metal bullets and tear gas canisters at dozens of protesters, who were on the road between the Palestinian and the Israeli sides of the crossing. The protesters threw stones at the soldiers in protest at the Israeli attacks against the Palestinian civilians in Jerusalem and the West Bank. As a result of the clashes, which continued until 17:30, three civilians were wounded. Two of whom were hit with live bullets, while the third was directly hit with a tear gas canister. At approximately 14:00 on Friday, dozens of youngsters headed to the border fence between the Gaza Strip and Israel, east of al-Bureij refugee camp in the center of the Gaza Strip. The protesters set fire to rubber tires and threw stones at the soldiers stationed behind the sand barriers along the border fence. Due to which, Israeli soldiers fired live ammunition and tear gas canisters at the protesters. As a result, 8 civilians, including a child, were wounded with live bullets. The wounded civilians were then taken to al-Aqsa Hospital in Deir al-Balah. The health condition of one of the wounded was described as serious, so he was transferred to al-Shifa hospital in Gaza, while the wounds of others ranger between minor and moderate. Following the Friday prayer on 27 November 2015, Palestinians from Bil'in, Ni'lin, al-Nabi Saleh and Budrus village, west and northwest of Ramallah and al-Bireh, organized a peaceful demonstration in protest against the annexation wall and settlement activities. The Israeli forces fired tear gas canisters, sound bombs and rubber-coated metal bullets at the protesters to disperse them. No casualties were reported. On Friday afternoon, dozens of young men gathered at the western entrance of Selwad village, northeast of Ramallah, on Selwad-Yabroud road, near the Bypass Road (60), in protest against the Israeli policies. The protesters set fire to rubber tires and threw stones and Molotov cocktails at the soldiers. Due to which, the soldiers fired live ammunition, rubber- coated metal bullets and tear gas canisters at the stone-throwers and chased them into the village. As a result, a 22-year-old male, who was hit with a rubber-coated metal bullet to the upper lip and then was taken to Palestine Medical Complex in Ramallah to receive medical treatment. At approximately 12:00 on Friday, Palestinian civilians and Israeli and international human rights defenders organized a protest in the center of Kufor Qaddoum village, northeast of Qalqilya, and made their way to the eastern entrance of the village in protest against closing that entrance since the beginning of al-Aqsa Intifada with an iron gate. When protesters arrived at the gate, Israeli forces fired live ammunition, tear gas canisters, rubber-coated steel bullets and sound bombs at them. As a result, many civilians, including a child, were wounded with live bullets. On Saturday, 28 November 2015, dozens of Palestinian young men gathered in the center of Budrus village, west of Ramallah and al-Bireh, and then made their way to the annexation wall in the southwest of the abovementioned village. The Israeli forces closed the wall gate with barbed wires and prevented the demonstrators from heading to lands behind it. Due to which, the protesters threw stones at the soldiers, who fired live ammunition, rubber-coated metal bullets, sound bombs and tear gas canisters at the protesters and chased them between the olive fields until the village outskirts. As a result, a 17-year-old male, was hit with a live bullet to his left leg. At approximately 12:00 on Saturday, 28 November 2015, Palestinian civilians and international human rights defenders organized a demonstration from the center of Kafor Qadoum village, northeast of Qalqilya, and then headed to the eastern entrance of the village in protest against closing the entrance since the beginning of al-Aqsa Intifada with an iron gate. When the protesters arrived at the gate, the Israeli forces fired live ammunition, tear gas canisters, rubber-coated steel bullets and sound bombs at the protesters in response. As a result, 3 civilians were hit with live bullets. One of whom sustained serious wounds and underwent an operation due to a rupture in a blood vessel in his leg. Israeli violations of international law and international humanitarian law in the oPt continued during the reporting period (19 – 25 November 2015). In new wilful killing crime committed on Thursday, 19 November 2015, Israeli forces killed Shadi Arafah (28), from Hebron, who driving his car near "Gosh Etzion" settlement compound, south of Bethlehem, at the same time when another Palestinian was opening fire at Israeli settlers. Following the killing of Arafah, Israeli forces declared that it was an accident. On the same day afternoon, medical sources pronounced Mahmoud Elayan (19), from Anata village, northeast of occupied Jerusalem, dead of wounds he sustained earlier. The aforementioned person was seriously wounded on 11 November 2015, at the northern entrance of al-Bireh town. He was then referred to an Israeli hospital in West Jerusalem to receive the necessary medical treatment. He remained there until he succumbed to his injury. Elayan was hit with a hard object to the back of his head, due to which, the skull was fractured and parts of his brain were damaged. On 22 November 2015, Israeli forces stationed in a watchtower at Hawarah checkpoint, south of Nablus, killed Ashraqat Qatanani (16), from Askar refugee camp, northeast of the city. Israel forces claimed that she attempted to stab 2 female settlers, who were near the checkpoint. On the same day, a settler opened fire at Shadi Khsaib (31), from Ein Mesbah neighbourhood, in Ramallah, when the latter was passing through "Kfar Adumim" settlement intersection, east of occupied Jerusalem. As a result, Khsaib was killed. Israeli forces claimed that Khsaib was driving a taxi "attempting to run over 2 settlers at the intersection, but he could not. Therefore, he stepped out of the car holding a knife in an attempt to stab them. However, a settler opened fire at him and shot him dead". Also on the same day, Israeli forces deployed on the main road in front of "Gosh Etzion" settlement, south of Bethlehem, killed Esam Thawabtah (31), from Beit Fajjar village, south of Bethlehem. Israeli forces claimed that the aforementioned person stabbed a female settler and killed her. Thawabtah's corpse was taken to an unknown destination. On 23 November 2015, Israeli forces stationed at Hawarah checkpoint, south of Nablus, killed Alaa Hashash (16), from Askar refugee camp, northeast of Nablus. They claimed that he attempted to stab settlers at a bus stop. However, PCHR's investigations refute the Israeli story, as the aforementioned child passed through the checkpoint in front of Israeli forces and was holding nothing with him. Moreover, no settlers were present at the bus stop then. Israeli forces also seriously wounded a Palestinian young woman, as she was sitting in her father's car. On the same day, an Israeli police officer opened fire at 2 Palestinian girl children namely Hadeel Awad (16) and Nourhan Awad (14), from Qalandia area, north of East Jerusalem. As a result, the first child was killed and the other was seriously wounded as they were shot from a close range. Israeli forces claimed that the 2 girls were fired at as they attempted to stab Israeli settlers with scissors on Jaffa Street in West Jerusalem. Also on the same day, Israeli forces killed Ahmed Taha (20), from Qatannah village, northwest of occupied Jerusalem, while he was present in a gas station on road (443) between Jerusalem and Israel. The Israeli police stated that Israeli forces that were present in the area opened fire at a Palestinian, who killed a settler and wounded another. On 25 November 2015, Israeli forces stationed at the western entrance of al-Fawar refugee camp, south of Hebron, shot dead Mohammed al-Shobaki (21) from the aforementioned camp after stabbing an Israeli soldier stationed at the entrance. As a result, he was hit with several bullets throughout his body and then taken to Hadassa Hospital in Jerusalem, where his death was shortly declared. In the afternoon, medical sources in Palestine Medical Complex in Ramallah declared the death of Ibrahim Dawoud (16) from Deir Ghassanah village, northwest of the city as he was wounded on 11 November 2015 at the northern entrance of al-Bireh. Dawoud is the second wounded person who succumbed to his wounds during this week among those wounded in the aforementioned day in the same incident. During this week, 91 Palestinians, including 24 children, 2 girls and a journalist, were wounded. Six of whom, including a child, were wounded in occupied East Jerusalem and its suburbs while the rest were wounded in the West Bank Cities. In peaceful protests against Israeli policies: 75 Palestinian civilians, including 21 children and a girl, were wounded. Fifty-nine of them were hit with live bullets and 16 others were hit with rubber-coated metal bullets. In peaceful protests against Israeli incursion: 6 Palestinian civilians, including a child, were wounded. Five of them were hit with live bullets, and one was hit with a rubber-coated metal bullet. At the checkpoints and public roads: 2 Palestinian civilians were wounded. One of them was a girl who was hit with live bullets. In peaceful protests against the annexation wall and settlement activities: 2 Palestinian civilians were hit with rubber-coated metal bullets. Palestinian civilians wounded in occupied Jerusalem: 6 civilians, including a child, were wounded. Five of them were hit with live bullets and one was hit with a rubber-coated metal bullet. In the Gaza Strip, Israeli forces wounded 30 civilians, including 5 children and a journalist. Twenty-nine of them were hit with live bullets, and one with a rubber-coated metal bullet in addition to dozens who suffered tear gas inhalation. In the Gaza Strip, Israeli forces wounded 18 civilians. Sixteen of them, including 3 children and 2 journalists, were wounded in peaceful protests, while 2 fishermen were wounded in the sea. Eleven of the wounded were hit with live bullets, 3 were hit with rubber bullets and 4 were hit with tear gas canisters. North of the Gaza Strip: 2 Palestinian civilians, including a child, were wounded; one of whom sustained a live bullet wound, and the other was hit with rubber-coated metal bullets. Gaza City: 14 Palestinian civilians, including a child, were hit with live bullets. Central Gaza Strip: 10 Palestinian civilians, including a child and a journalist, were hit with live bullets. Khan Yunis: 4 Palestinian civilians, including 2 children, sustained live bullet wounds. In the context of shooting incidents at the border area, on 20 November 2015, Israeli forces stationed along the border fence between Israel and the Gaza Strip, east of Jabalia in the northern Gaza Strip, opened fire at the border area, but neither casualties nor material damage were reported. The shooting recurred in the same area on 21 November 2015. On 25 November 2015, Israeli forces stationed along the border fence between the Gaza Strip and Israel, east of Khan Younis in the southern Gaza Strip, opened fire at the agricultural lands and residential neighbourhoods in Khaza'ah village to the west of the aforementioned fence. On 25 November 2015, the shooting recurred in the same area, but no casualties were reported. Concerning targeting Palestinian fishermen in the Gaza Strip Sea, at approximately 07:00 on Sunday, 22 November 2015, Israeli gunboats stationed off al-Waha resort, west of Jabalia, north of the Gaza Strip, opened fire in the vicinity of Palestinian fishing boats and chased them. A similar shooting incident was reported on 23 and 25 November 2015, but no casualties were reported. In the context of Israeli airstrikes, on 23 November 2015, Israeli warplanes raided a Palestinian training site, southwest of al-Bureij refugee camp, but no casualties were reported. During the reporting period, Israeli forces conducted at least 88 military incursions into Palestinian communities in the West Bank and 10 ones in occupied East Jerusalem. During these incursions, Israeli forces arrested at least 166 Palestinian civilians, including 35 children. Twenty-seven of these civilians, including 14 children, were arrested in East Jerusalem. During this week, Israeli forces raided and searched Hebron Radio office in al-Dehdah area in the northern area of Hebron. One of its officers handed the Station Director a military order to shut down the station and confiscate its contents. The Israeli forces' order says that the radio will be shut down for 6 months for "broadcasting incitement". In the Gaza Strip, on 25 November 2015, Israeli forces conducted a limited incursion in the border area, east of al-Shuhadaa' Cemetery, east of Jabalaia in the northern Gaza Strip,a dn then headed to the southeast of the industrial area, east of al-Tufah neighbourhood, northeast of Gaza City. Neither causalities nor damages were reported. On 20 November 2015, group of Israeli settlers from "Talmoun" settlement established on the western side of the Palestinian lands confiscated from al-Mazra'ah al-Qebliyah village, northwest of Ramallah and al-Bireh, attacked a house belonging to Mohammed Soliman Abu Qare'a. The settlers threw stones at the glass of the balcony's window overlooking the backyard and Molotov cocktails inside it. As a result, a plastic table in the balcony caught fire. On the same day, a group of settlers from "'Immanuel" settlement established on the lands of Deiristaya, northwest of Salfit, attacked a Palestinian taxi cab driven by Malek Mahmoud Helmi Tuleib (35) from nearby Qeirah village causing severe damages to the car. 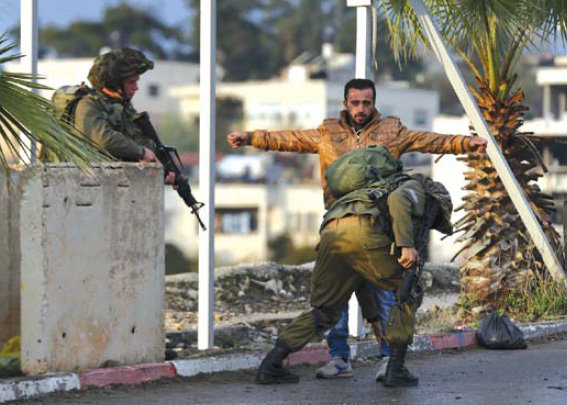 On 22 November 2015, around 20 settlers from "Yitsahar" settlement and under the Israeli forces' protect attacked Burin High Schoold for Boys established at the north-eastern of Burin village, south of Nablus. On the same day, settlers closed the main Tulkarm-Nablus Street near al-Tanib Factory and threw stones at Palestinian vehicles travelling on the Street.